Arteries are blood vessels that carry oxygenated blood from the lungs to the heart and then to other parts of the body. 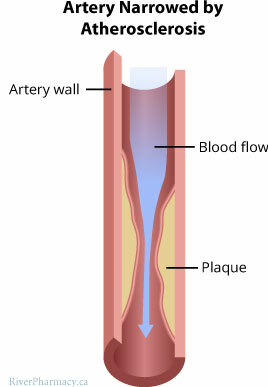 Atherosclerosis occurs when plaque builds up along inner arterial walls restricting blood flow. Plaque consists of fatty substances, cholesterol, calcium, and other substances. Atherosclerosis comes from the Greek words athero, meaning gruel or paste and sclerosis, meaning hardening. Scientists don't know exactly how or why atherosclerosis starts. It can begin in childhood and usually exhibits no symptoms until middle age or older. As it develops, plaque builds up inside the inner lining of large and medium-sized arteries. Risk factors for atherosclerosis include high blood pressure, high cholesterol, and smoking. Plaque buildup significantly reduces blood flow in one or more arteries. A plaque ruptures causing a blood clot to form inside the artery. Our official Facebook page is: RiverPharmacyOnline. We will be posting links to FAQs, tips, and updates on a regular basis. If you have questions, please do NOT post private information (order numbers, phone numbers, credit card information, etc.) to our timeline. You can send us a private message on Facebook or even better, call us toll-free at 1-888-848-1945 and chat with us on the phone. River Pharmacy specials are regularly posted on our Facebook page. Take a look at how you can save, and make sure you follow us for more specials every month. Isosorbide mononitrate (Imdur, Monopark, Monoket) is used to prevent or treat angina (chest pain). Isosorbide tablets may be used with other drugs to treat congestive heart failure. They work by relaxing the blood vessels to the heart, so the blood and oxygen supply to the heart is increased. Isosorbide mononitrate can cause low blood pressure (hypotension). Other medications, which can reduce blood pressure, may produce additive effects causing serious drops in blood pressure. are taking quinidine, procainamide, benzodiazepines such as diazepam (Valium) or opiates (e.g. morphine). Read more about Isosorbide Mononitrate or view product information.